The Berger Picard (or Picardy Shepherd) is a delightfully scruffy and rustic looking, little known but very old French herding dog. Sadly, their numbers were decimated during the two World Wars and the Berger Picard almost disappeared completely. Capstone Berger Picards is a small breeder committed to carefully restoring, while preserving the qualities of, this magnificent and versatile breed. We are located just west of Ottawa, Ontario, Canada. Our dogs are thoroughly health tested, and the results of their tests are publicly recorded and available in the OFA database. Good health as well as stable temperaments and character are equally important to the correct conformation and working ability of these dogs and we believe one aspect should not be sacrificed for another. Our dogs enjoy many successes in the CKC, FCC and UKC conformation rings as well as a variety of performance activities. We love the UKC Total Dog philosophy, and feel this produces a happy, well rounded, properly socialized canine companion. We encourage our future puppy homes to work with their dog, be it through conformation, herding, rally-o, obedience, agility, nosework, therapy work, lure coursing, disc, or any other mutually enjoyable activity. Our dogs are registered with the CKC, AKC and UKC registries. The health and well being of our dogs comes first and foremost, and our breedings are carefully planned. We may occasionally have puppies available, and although we prefer to place our pups in performance or show homes, all inquiries will be carefully considered. This is Ekeko when he was 9 weeks old. His delightful personality and good natured sense of humour is what started us on this wonderful adventure. He is truly my heart dog; the first dog that I have ever had that has made me feel so passionate about a particular breed, and the reason why I decided to try to help protect and restore this incredible breed. We are excited to be a founding member of the Berger Picard Club Canada. The BPCC is the accredited national breed club for the Canadian Kennel Club. The club's mandate is to bring together Berger Picard owners from across Canada, provide breed education, promote responsible ownership, and protect the health and genetic diversity this special breed. We are proud to be a member of the Berger Picard Club of America, the official AKC parent club for the Berger Picard. Their website is also an excellent resource for information on the breed and for club events. 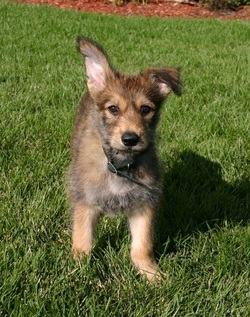 Berger Picard Club of the United States, a UKC club which formed to promote the Berger Picard, share expertise and provide breed education. 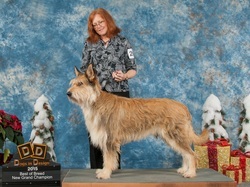 The BPCUS holds the largest UKC Berger Picard specialty show annually at the UKC Premier.